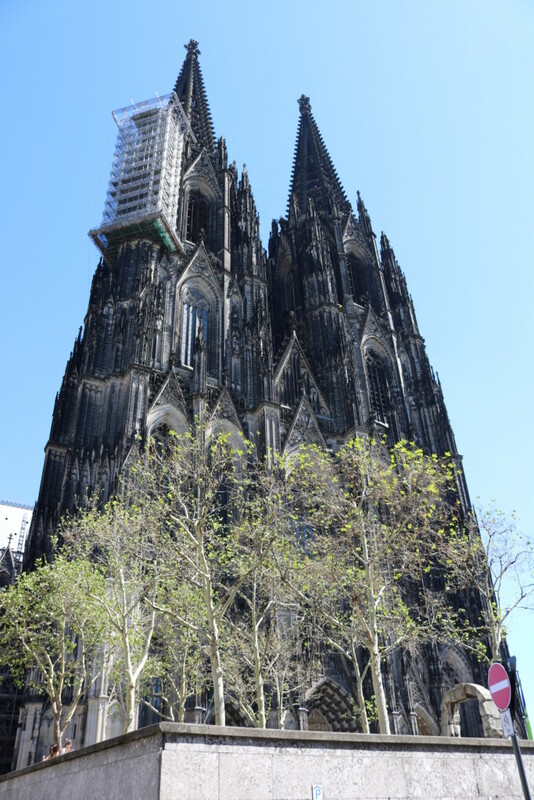 Remember last time how I said it was just a quick overnight stop in Cologne? I lied. 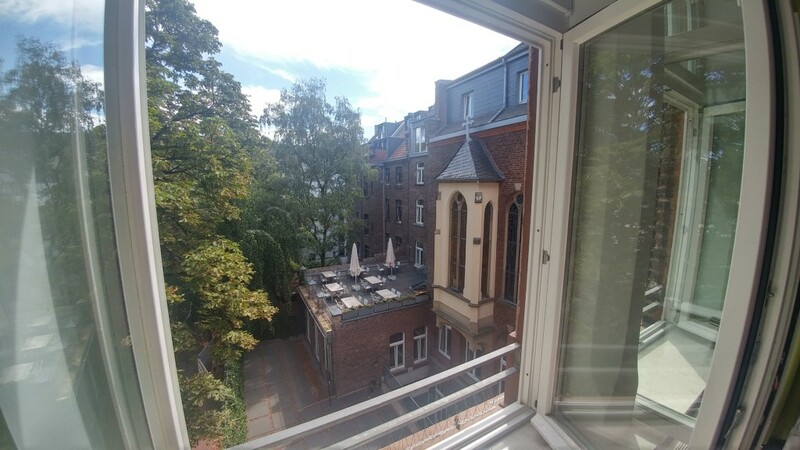 The our hotel room and the view from it was pretty nice. We were just off of a narrow strip of bakeries, coffee shops, and other establishments ready to feed a couple of hungry guys. After walking a few blocks checking things out, we settled on a leisurely breakfast at a casual bakery. Missed the beginning of the trip? Start here. The view from our room’s window. The patio with the tables is just outside the main dining room. Each room in the hotel has art pieces on display from a local art college. 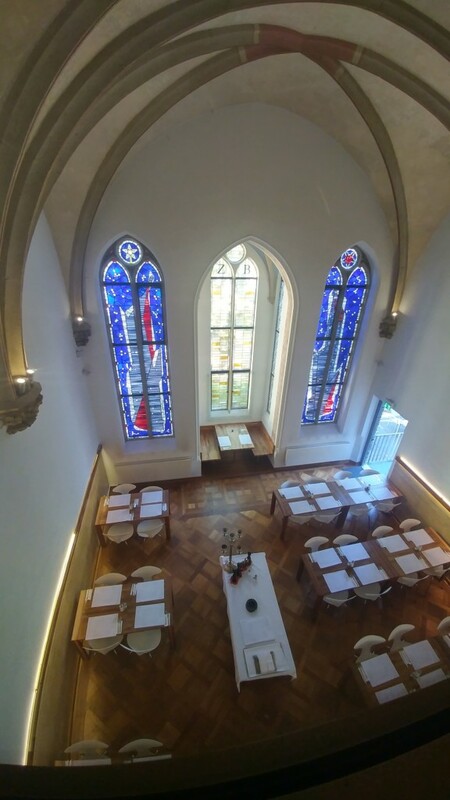 The hotel’s breakfast/dining room, once the convent house’s chapel. Bath area and closet in our room. 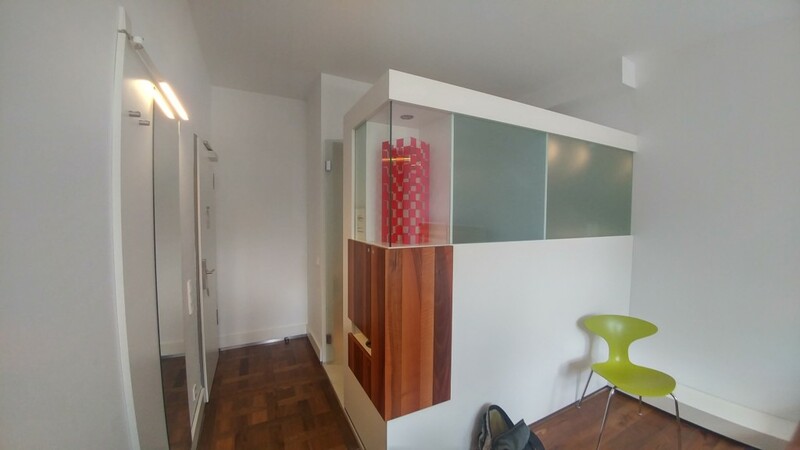 The glass door on the left hides the toilet, and it also latches to close off the bathroom from the rest of the room entirely. 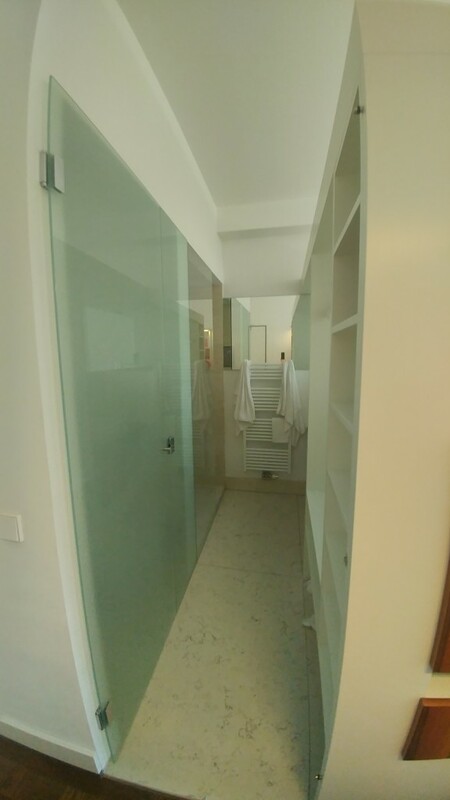 Just a few things hidden inside the “wall” separating the bathroom from the living area of the hotel room. 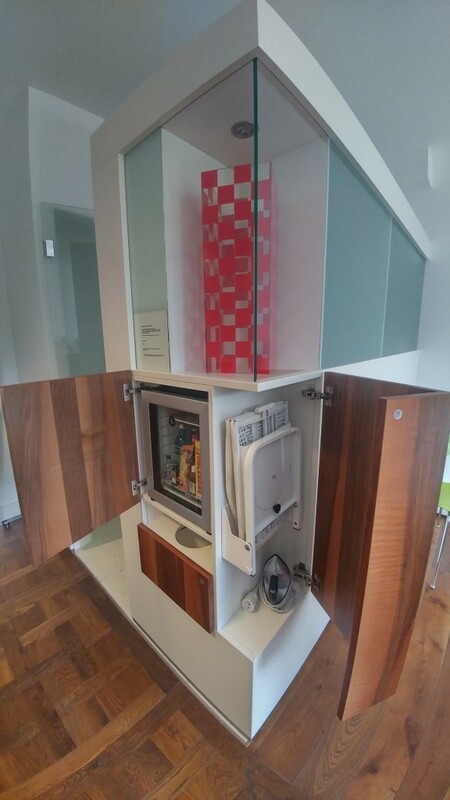 Mini-fridge, trash bin, and ironing board are easy to access, but out of sight. We’d checked out of our hotel room (might thave done that before breakfast, but I’m not sure), and hopped in the car to start the drive to Vienna. I read a little bit about the cathedral downtown while Andrew was still sleeping, and thought it’d be neat to drive by. We made a couple of wrong turns trying to get a good view, and by the time we got to where we wanted to be, we decided that it was worth parking and getting some photos. This place is big. 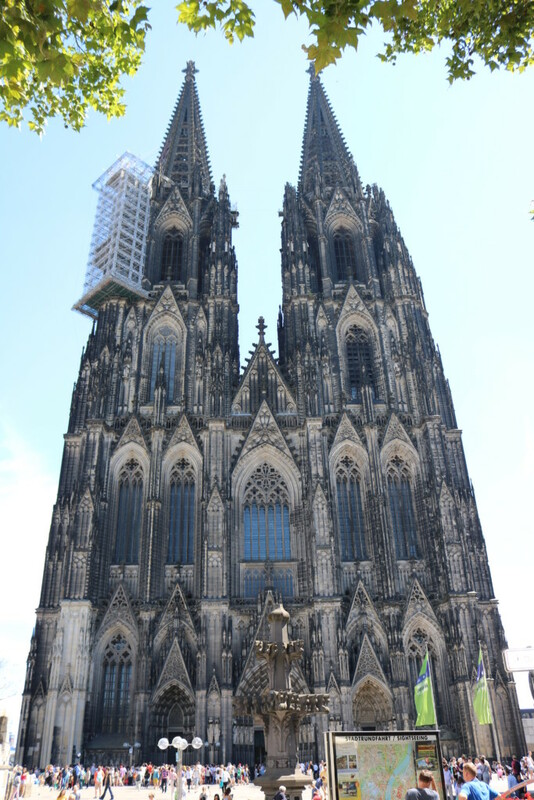 To put it in perspective, it was the tallest building in the world until its completion (eclipsed when the Washington Monument was completed), and has the largest façade of any church in the world. The site was occupied by Christian structures starting in the fourth century, and the second cathedral on the site was built in the 9th. 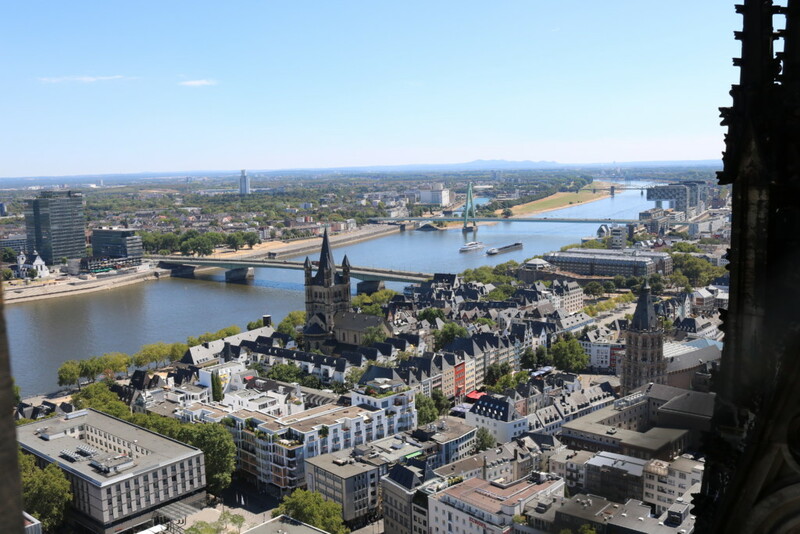 The foundation was laid for the present cathedral in 1248, but construction was halted in 1473, and it would remain incomplete until the 19th century. The time scale is as hard to fathom as its size is to take in. Think about the Empire State and how it has defined the skyline of New York City. 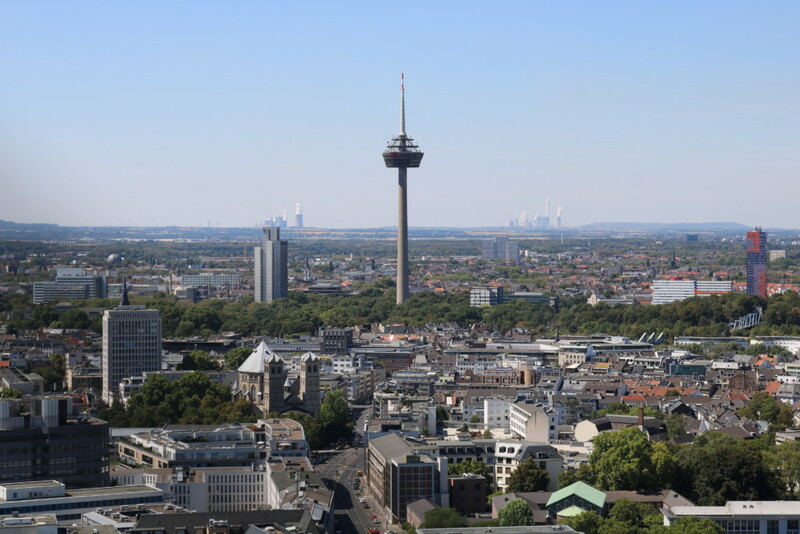 Now think about it sitting incomplete, defining that skyline, beginning with the arrival of the Dutch until today, and for another couple hundred years or so. Then only 6 decades after, being hit 14 times by Allied bombs in World War II. As you take in the history standing in the plaza at the west-facing main entrance, you stand kind of in awe at the engineering prowess 900 years ago. The building was ultimately completed based on the original plans, rediscovered in the 19th century. We figured we might as well venture inside. 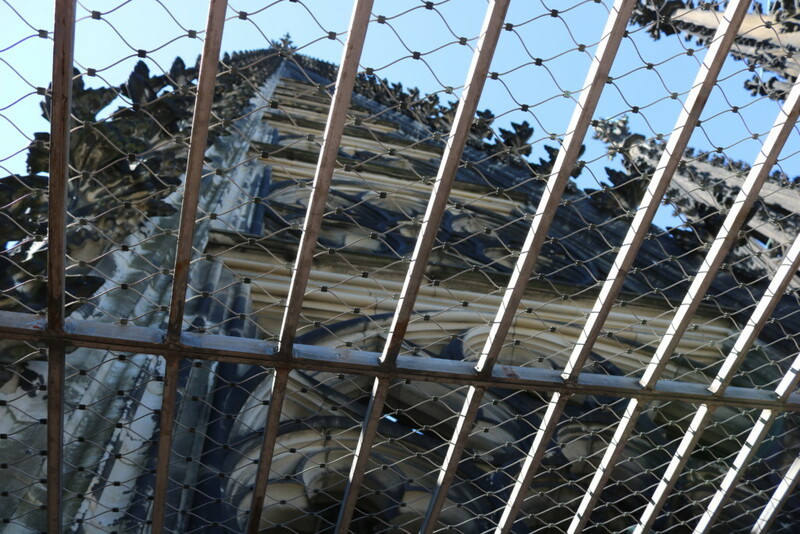 533 Steps. To the top! After leaving the cathedral, we went down to a lower-level, more modern entrance with a gift shop and public restrooms. We did have quite a drive ahead, and this would be our last chance for a pit stop before hitting the road. 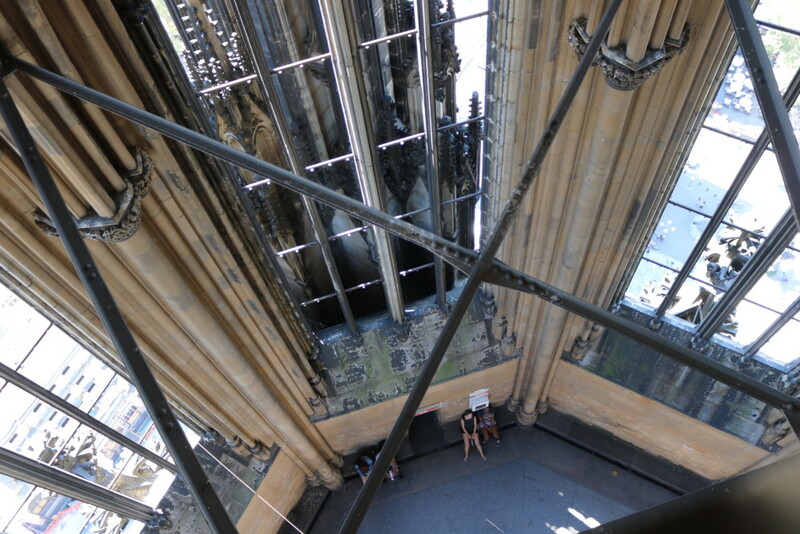 But then I saw the entrance, and remembered reading about the 533 steps up a single spiral staircase to the belfry. 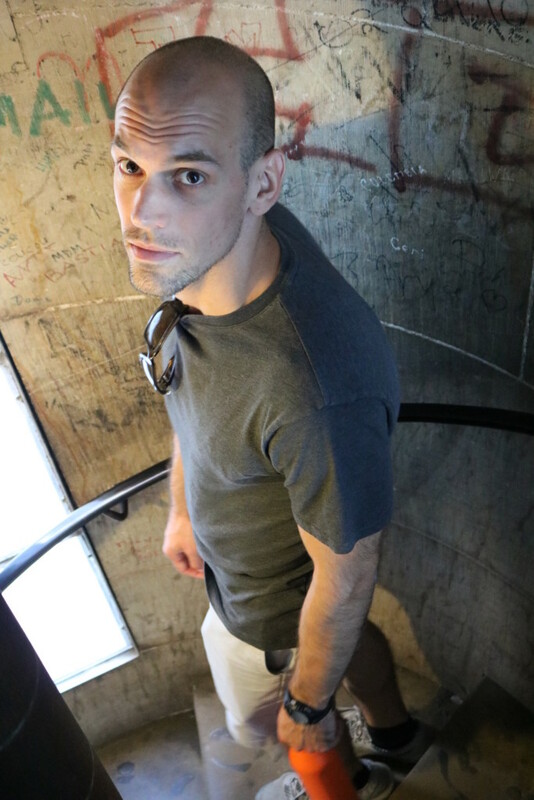 We paid 7 Euros each for the privilege of climbing to the top, and started breathing a little heavy shortly thereafter. There are regular, but foggy, windows at regular intervals on the way up. You know you’re climbing, but don’t really get much of a view. 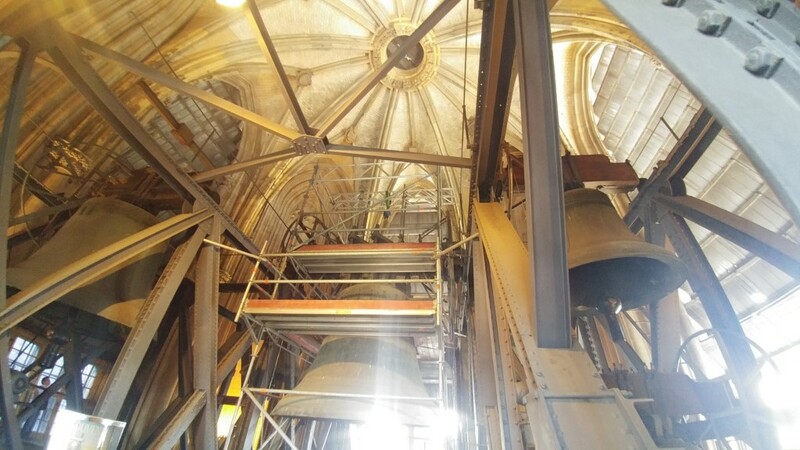 Upon reaching the belfry, you see large windows, and enter a grand hall containing a number of large bells–including one weighing over 20,000 lbs that was hoisted in place in 1448. I know we have big cranes and heavy-lift helicopters today, but I’d be really interested to see how they did that. 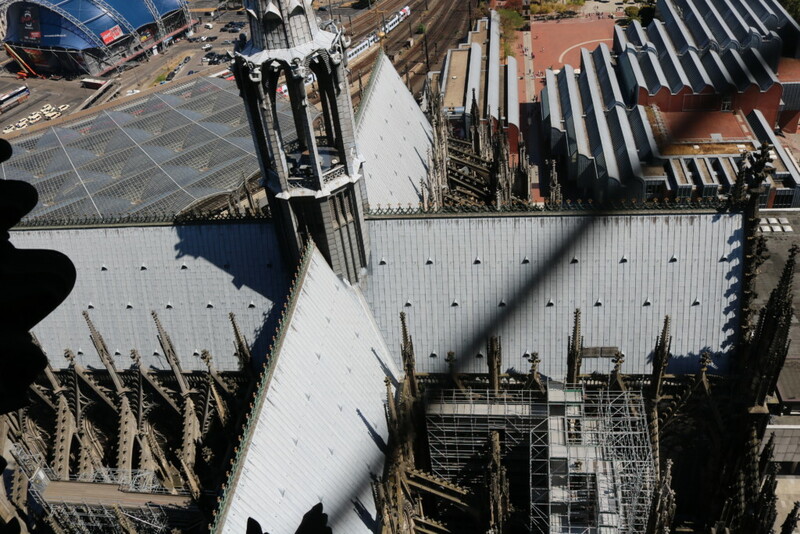 If the medieval bells aren’t big enough for you, there’s the more modern Bell of St. Peter, cast in 1922 and weighing a fully-loaded Millennium Coach, 50 stories up in the air. Impressive, to say the least. But the staircase wasn’t finished yet. A few stories higher is an airy but enclosed atrium of sorts, with another newer metal staircase disappearing into a small opening in the ceiling. 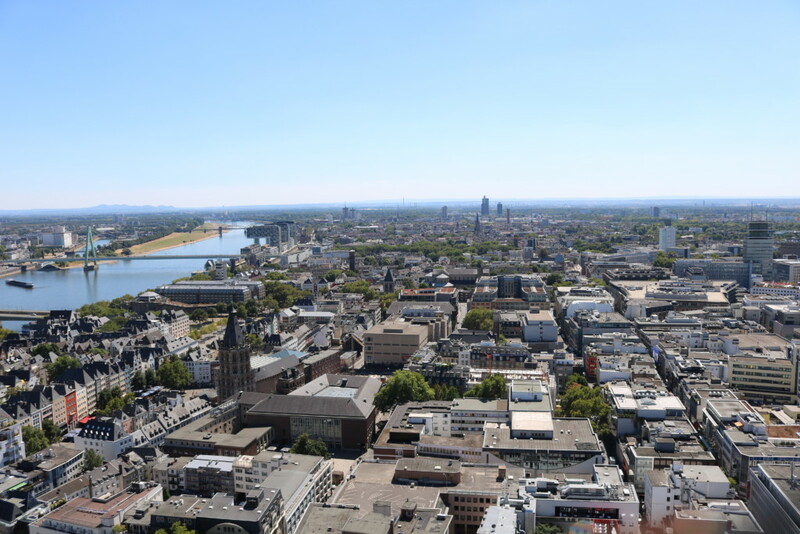 Climbing that brings you to an observation deck around the top of the tower, providing jaw-dropping views of Cologne and the distant countryside. Eventually, back at the bottom, I paid dearly for a small-by-American-standards Coke. We ate a late lunch at an Asian restaurant and hit the road. Yes, that’s about $3 for what would be a “small” Coke in the United States. And it’s already after 4 o’clock! Good thing most of the drive is on German Autobahn, where we should be able to make good time. But of course, not all of it is speed unrestricted, and we have traffic and road construction to deal with. It took us a bit to get comfortable with tiny little speed limit signs that would abruptly tell us to reduce our speed from “reasonable and prudent” to 50 mph. While lane discipline was far better than in most of the US without speed limits, there were still far too many left lane hogs for truly efficient cruising. As a result, even with our pedal-to-the-metal-whenever-possible approach to driving, our highest average speed between stops was only 82.5 mph. We were cruising at 120 mph whenever traffic wasn’t interfering, given enough time for 110 hp to get us to that speed. And the land of speed cameras. And speed limits. And lower speed limits at night. And more speed cameras. And a toll sticker you had to buy at the border, just to use the highway network for a couple of days. We were slightly excited at the news less than a week before we arrived at the posting of new, higher speed limits on much of Austria’s freeway network. While not unlimited, the new 87 mph limits are higher than anything allowed in the land of the free, so long as it’s before 10 pm. We crossed the border right about 10 pm. Ugh. We’d have to settle for 81 mph or less whenever the car alerted us to a speed camera. Except it gets worse. 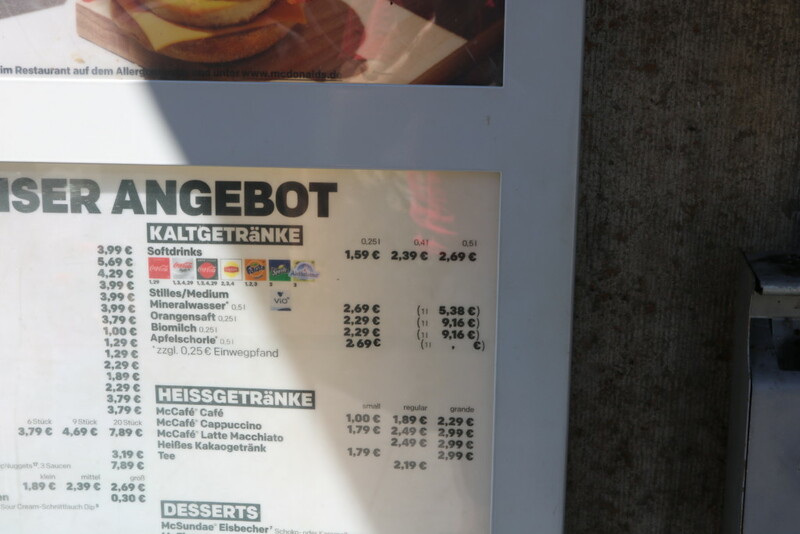 Austria also uses average speed cameras, measuring the time it takes for you to cover a longer distance. So I made Andrew do the late-night driving to Vienna, where we arrived just before 2am. I felt bad keeping John up waiting for us, but like any good host he was ready to give us a warm Viennese welcome (well, maybe a little bit of a familiar Texas welcome too). Proudly powered by WordPress | Theme: Perennial by DesignOrbital. Can I deduct sales tax paid on my new RV? How? Can you deduct your towable RV’s loan interest for 2018?